" We Are A Very Honest Company " - " Our Business Practices That We Are Proud To Claim "
1. We Never - Telemarket. We don't have any telemarketers. 2. We Never - Mail out deceiving mailer letters ( Postal Mail ) to you. 3. We Never - Mention fines on our website. 4. We Never - Deceive or use scare tactics to obtain a sale. 5. We Never - Try and sell you something you don't need. Our company provides - New Businesses, Human Resource Managers, Office Managers and Warehouse Managers with 2019 Mandatory Federal & State Labor Law Posters for your Company or Workplace. 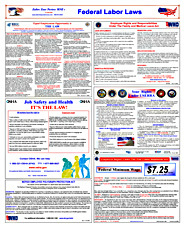 Our Staff: Labor Law Posters USA are here to Assist you in any way Possible. We will "NEVER" try and "Force Sell" Wasting Your Valuable Time. We Never Telemarket. We don't have any telemarketers. We do not believe in bothering anyone with sales call ever. The Owner - The company owner has ( 37 years ) of Human Resource and ( Employment Law ) experience. Our Company / Website has been online since 2003.